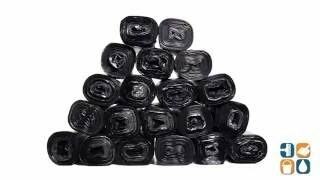 Guaranteeing consistent dependability, these star-sealed designed bottoms of the black trash bags evenly dispenses the weight creating a seal eight times sturdier than its own material. Manufactured in ISO registered facilities, the Formosa resin material ensures the trash bags are of the highest quality and reliability with greater tear resistance and larger load capacity in comparison to low density bags. The innovation doesn’t end with the trash bags. The new “clamshell” box has an E-Z identification code number to end any uncertainty. Buy now and save!